I’ve been having an odd problem lately. Too much Daredevil. Okay, so this is a really nice problem to have. In fact, it wouldn’t even be a problem at all if it weren’t for the fact that I haven’t had time to keep up around the blog. But, with the last episode of Daredevil: Road Warrior due out on Tuesday, and the new Daredevil #1 on Wednesday, it’s high time for this review. Let’s get to it! Well, the first chapter of Daredevil: Road Warrior took place on an airplane, and the second in (or rather on top of) a car. This time around we’re traveling by train. And by “we” I mean Daredevil and his intriguing companion. We finally learn about the mysterious past of this heartless (literally) man through a twist I did not see coming. And, just like Waid and Krause keep changing modes of transportation, they also switch up the tone with every new installment of this four-part story. If the first chapter felt like a romantic dramedy – and the second like a straight-up action thriller – then this most recent installment has Marvel Universe science fiction written all over it. And here’s the thing: I really like it. This story has been full of twists so far, but the biggest ones are seen this issue. It turns out that the man without a heartbeat is in fact not a man, but a machine, and a well-known and very powerful one at that. This in turn connects the events here to the greater Marvel Universe, and gives Peter Krause twice the amount of Daredevil to draw. 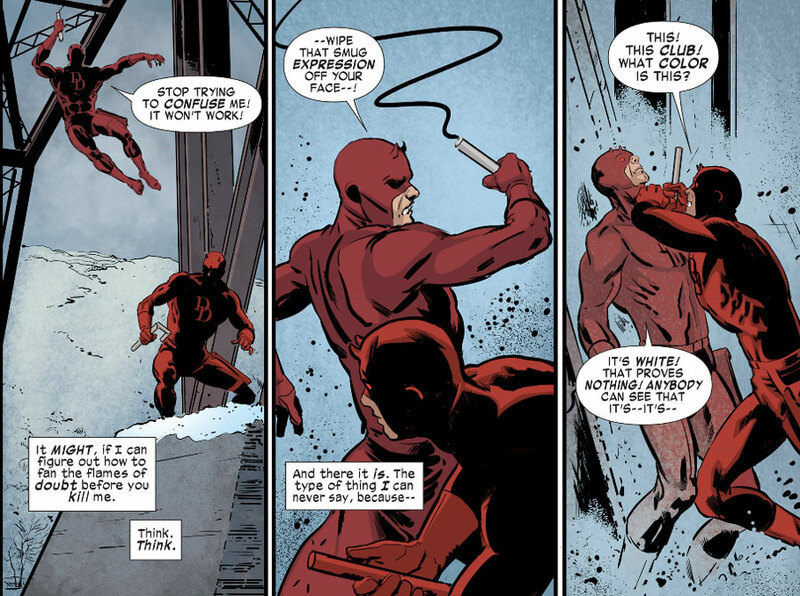 Fortunately for us all, he excels at it and the scenes of Daredevil interacting with this strange other are wonderfully choreographed. I’m particularly fond of the perspective in several of the panels, such as when the two are dangling under a bridge or what is seen the middle panel above, with one crouching Daredevil in the foreground and the other looming over him i the background. Krause also has a really great feel for human anatomy, and I love the looks of his Daredevil. There’s a fine line between crafting a story that continues to surprise the reader by going in new directions and exploring different tones, and one that seems random and disjointed. 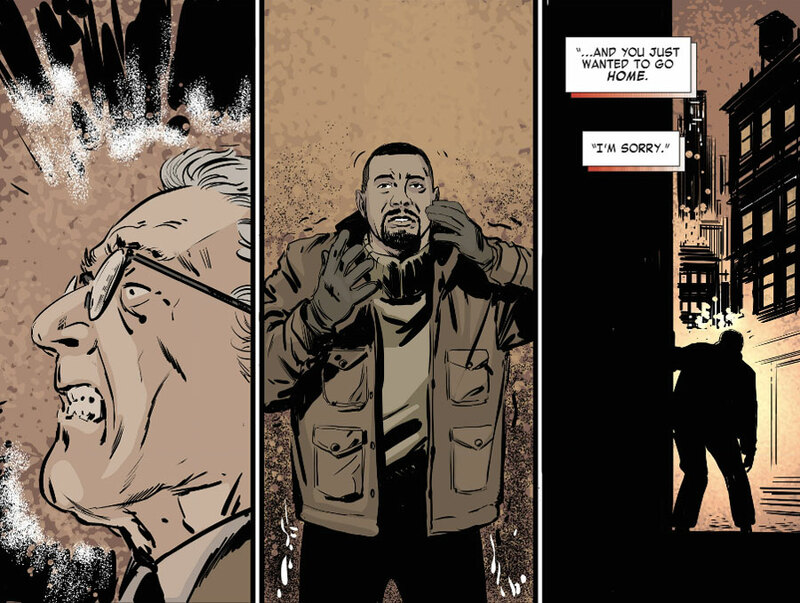 In lesser hands Daredevil: Road Warrior could easily have run the risk of being the latter, but the anything-could-happen vibe of the story is deliberate enough – and well-executed enough – to feel clever and inspired more than anything else. I’m not sure some of these twists would have worked quite as well if this had been a monthly series, however, as the pacing of the story itself really benefits from the tighter publication schedule. With the events of the last issue fresh in readers’ minds, Waid and Krause can spend less time on transitions and getting people up to speed and more time on keeping the story moving forward. Still, I’ll be very curious to see just how Daredevil will be able to make it to his final destination and fight a creepy villain in the span of the one remaining chapter. However, knowing that pacing is one of Mark Waid’s many superpowers as a writer, I have no doubt this story will wrap up beautifully. We’ll find out in less than forty-eight hours! Biggest surprise of all: Matt Murdock is left handed! Makes sense since southpaw boxers are all kinds of trouble.